Bred by Wayne Newton, WN Astra (Bluesprucetanzeer x Bint Rabidilla) was born in 1985 and began a 20-year show career in 1988. The talented chestnut gelding competed in driving, English pleasure and most recently walk/trot, earning too many Class A, Scottsdale and regional titles to count. 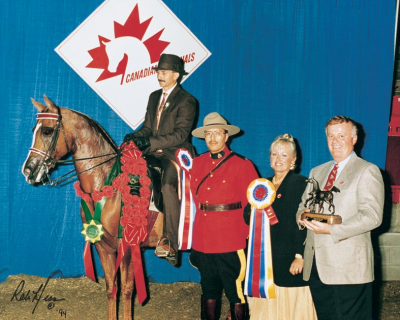 Throughout his career, he amassed an incredible 12 U.S. and Canadian National Top Ten awards, three U.S. and Canadian National Reserve Championships and six U.S. and Canadian National Championships.